In this multi-part MONEYPIT story, we follow the tale of EMI M400 #103S. 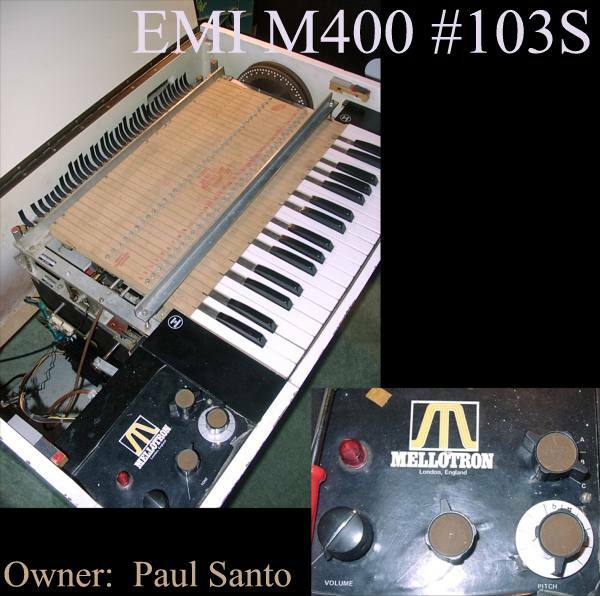 Jamie Robertson (new to MONEYPIT) and I wandered over to see what we could do with EMI M400 #103S that Paul Santo currently owns. Some of the problems included old motor control board, sub-standard power supply and the mechanics out of square. I had never really considered the latter but it really is very important that the internal frame is square. 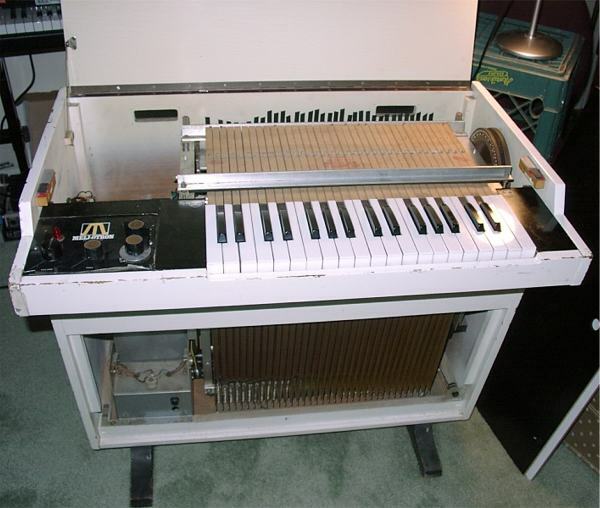 Mine wasn't so the keyboard was hard work to remove when changing tape frames plus as the tapes were not perpendicular to the heads the treble response of the machine was poor. The mis-alignment also meant that the tapes dragged on the guides so the pinch wheels had been adjusted to increase the pressure on the capstan (they were at the bottom of their adjustment) and still some tapes would drag. In some cases this was so bad they would squeak while playing. Jamie and I arrived to check out the EMI unit, and owner Paul got caught up on a number of other things (his schedule is usually packed, so having a Saturday free was quite unusual) while there was the usual Mellotron adjustment cacaphony going on, but he spent time with us to go over the machine as well. It's hard to believe the number of items that Norm nailed on his web page as applying to E4/103S as well---unfortunately. The motor controller was previously replaced with an SMS-5, so that work was done. The power supply seemed to be a stock M400 supply, but I didn't do anything with it. The keyboard was hard to remove, as if held on by a magnet. That was bizarre. It appears that the take-up box is out of square with the tapes (see picture to left). The pinch rollers for the top notes were cranked down to the bottom of their adjustment and still didn't play right. The bottom notes were better. I would try my best, folks, but only could get the machine so far---better than before, but not where it should be and can be. It likely needs a Leeting. It's painted white. 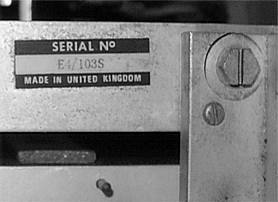 The original finish can be seen under the old serial number plate, which probably fell off somewhere. Shame, as I like the original finish on those cabinets. Paul informed me, though, that many EMI units did leave the factory white, so this could be a factory paint job. It appears that they had to chisel out some room for the front of the keyboard (probably done at the factory to make room for the keyboard). Cheek blocks are metal, not thick wood blocks as in the M400. Unfortunately the front and top pieces of this unit's lid have separated. The tapes are from Mellotron Archives (cello, 3-violin, flute). Missing one of the keyboard thumbscrews. The tape frame has a tape fastening screw snapped off. This one had me stumped. 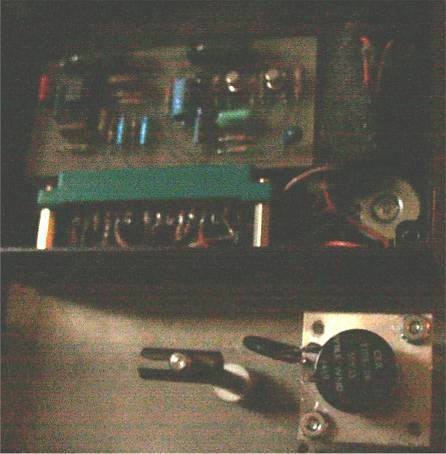 The pitch control is geared so that one turn of the knob is about 1/10 turn on the pitch control itself. I don't know if this is original or a replacement that someone made. Well, no real pitch dives on this box while playing, I guess! So what we attempted to do in the span of a few hours was to oil up and adjust the machine to get it as good as it could be in the as-is state. I had a sinking feeling it wouldn't be enough, given Norm's experience, but I had to try. The motor and capstan eagerly sucked up the oil I provided, and they ran more smoothly afterward. Heads and capstan were cleaned. The rollers were inspected. All turned OK, some chips here and there, but in fairly good condition. Adjusted. Painfully. Several hours. Mellotronists' Hunchback. Thankful for Jamie's help near the end. Some rollers blurbled on some of the tapes, so I took the shine off them and cleaned them up, and they worked much better. One key in the middle (D) was stubborn and wouldn't really adjust all that well. It plays, but it's hard to press down, as the pinch roller obviously requires a lot of pressure to operate now. Some pinch rollers weren't parallel to the tape path, thus pushing the tape sideways. I held my breath and gently twisted them back straight with some channel lock pliers. Some pinch roller holders weren't parallel to the key they were on. Fortunately the screws allow for a small amount of adjustment, and sometimes that millimeter or two really helps. Something's out of square. Not much I could do in an afternoon for that. We also got a lot of blurbling on some notes, and this seemed to be in concert with the motor vibration. The only way I could get rid of those was to crank down the pinch roller and pressure pad a bit more than they probably needed to be. One of the pinch rollers seemed to be a Mellotron Archives replacement. It was not secured, just snapped into place, and one side of the axle was loose. I swapped it into key #35 and crimped it as best I could. I don't know the best way to get those to stay in other than that, but I'm sure there's a decent method available. I adjusted the "glad to see ya!" keys (several key return spring nylocks were cranked too far), loosened up the holes at the front of the keys so the keys weren't hung up on the posts, and adjusted the key height to something Paul thought was OK (I didn't have a ruler there for the 3/4" throw). Jamie helped with a few, too. ...well, 'til he tried it later on, and some of the dodgy notes were back. Paul will be able to take care of these somewhat, I'm sure, but I'm still haunted by "it's an EMI...square up the frame...disassemble it, square it up...". I let Paul know about the experience that Norm Leete had with his EMI M400 and various bits of contact information that should be helpful if he decides to have this machine squared up. I would like to see it right as rain, as it is pegged to be used on recordings coming up! Without a rebuild, the machine would only get as good as "just good enough but you kinda know something is wrong, and it's just enough to notice." Your Humble Scribe housed this machine for about a month over the winter '03-'04 and tried everything outside of dismantling it completely, including squaring up the frame a little. But there was still something wrong, especially on wide chords---just enough to be aggravating. With the purchase of a nice little M400, the EMI's fate was sealed. Over Memorial Day Weekend 2004 the machine was made "good enough" after having parts scavenged earlier---it was once again running and making sound. But on June 1, 2004 the EMI was put into the back of the car and brought to a local music shop as a trade in. Paul is a songwriter/musician/producer/engineer from the Boston, MA area. He's currently working with a local band rocketscience to produce their first album, and he has been providing keyboard work for Aerosmith for quite a while now. Paul recently toured and recorded with Ringo Starr. Paul was half the team that did the recording work for "RINGO RAMA", released in the spring of 2003. Paul had the opportunity to work with Eric Clapton and David Gilmour during the recording sessions. 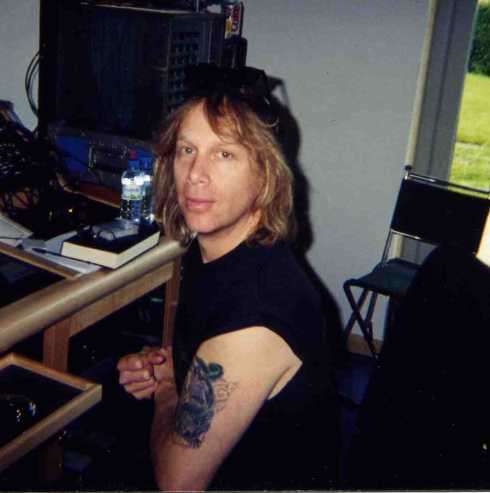 In addition, he co-wrote one song on the album and contributed electric guitar and bass tracks. A platinum album graces Paul's wall. 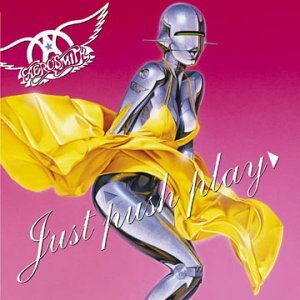 It's from Steven Tyler, with thanks for his contributions to Aerosmith's platinum-selling "Just Push Play": Hammond organ on "Avant Garden"; Kurzweil on "Fly Away From Here". And sitting next to a James Brown doll: a Latin Grammy! Paul has a variety of instruments from which to choose, including any number of guitars (a 50 year old Gibson acoustic is a fave--old, but sound that's rich and full with the right amount of grit), a wonderful '70 or '71 Fender Precision bass, Wurlie electric pianos, a honkin' Kurzweil, Hammonds (and Leslie), and even an Optigan. The real center of his collection, however, is guitar amps, all vintage (one new for good measure). Marry that to an array of guitar effects, and you have just about any guitar sound you'd ever want! taken up by M400 #1428. Please note that Yours Truly does NOT take any money for his work on Mellotrons and has never professed to be anything other than an amateur. If I'm unable to get a machine 100%, it's not from a lack of trying or from anything less than a best effort. The owner of the machine understands this, as did Paul with the EMI. I'm just sorry that it didn't work out with this one on this go 'round. Other folks are available to repair or restore your machine professionally. Post to the Mellotronists list if you would like your machine done over by someone who knows all the ins and outs. It is not inexpensive, but there's a lot of real talent out there on the list from repairs to the M400 to specialized repairs on the Mark II and M300.